For those unfamiliar with the Lace Market area of Nottingham, let's take a little tour and delve into a bit of history, and see what's still there today. Lacemaking is one of the key aspects of the history of Nottingham, and this quarter-mile square area shows something of the impact lace has had upon the area. 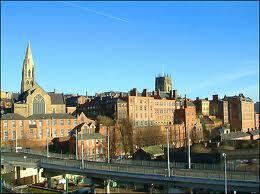 The area was officially named 'The Lace Market' in 1847. 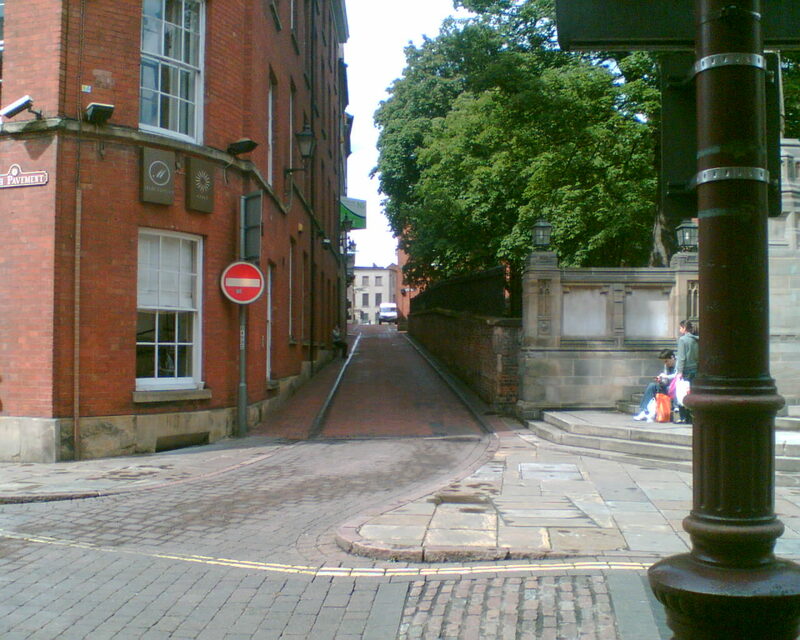 The area is bordered by the City Centre, Hockley Village, the Ice Rink and the Capital FM Arena. 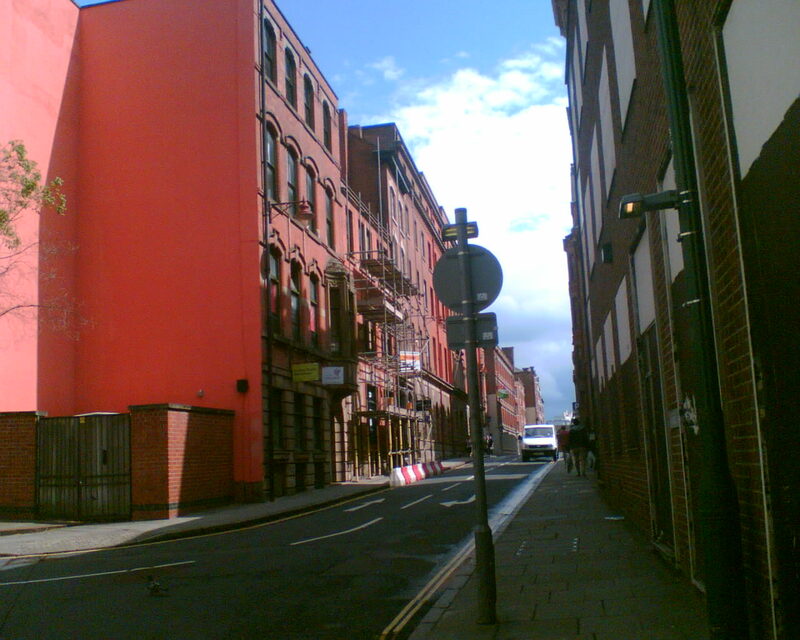 The majority of the Lace Market is typical Victorian, with alleys and narrow streets in-between densely packed 4-7 story red brick buildings. Pre-industrialisation, it is said that "as many as 120,000 people and their families made their living by creating stockings and bobbin lace from cotton thread in their own homes, fuelled by the cotton mill built in the village of Hockley by Richard Arkwright in 1770". The first stocking machine was invented in Nottingham by William Lee in 1685, but it was really the Industrial Revolution that left its mark on the City. The move was away from the home to the factory, as even some of the early machines were 600 times more productive than one person making by hand. In 1870 there were 224 factories in Nottingham, and just 20 years later there were 500, where nearly 17,000 were employed in the lace trade. Throughout the early 1900's, Nottingham dominated the machine-made lace industry, with nearly all of the machine lace in the United Kingdom being produced, finished, processed or shipped through one or another of the City's lace businesses. Nearly every passenger ship that travelled across the Atlantic in those decades carried a cargo of Nottingham lace. 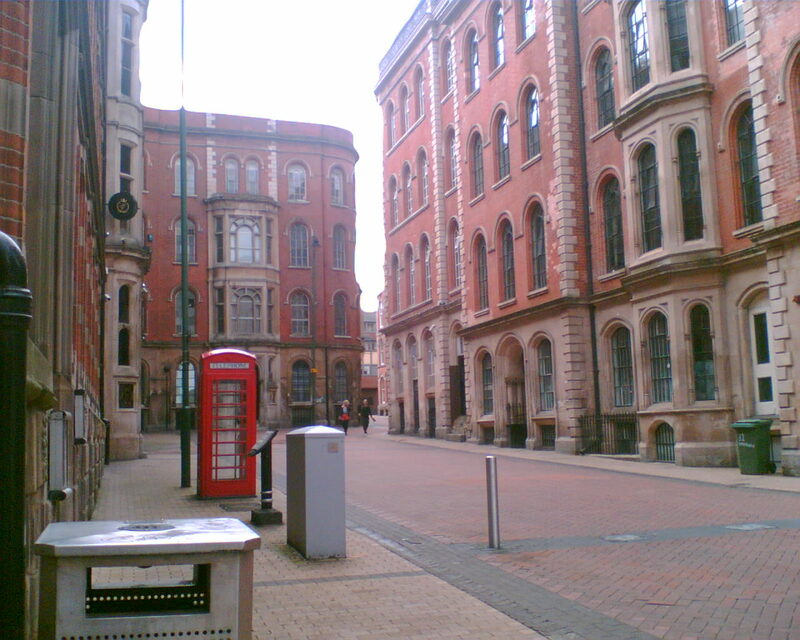 In addition to the vast amount of trade created, the area is renowned for its buildings, and the prolific local architect, Watson Fothergill was responsible for designing around 100 buildings alone in the Lace Market between 1870 and 1906. Many buildings go back before his time of course, and I thought that you might value a brief look at four such buildings, as you get a flavour of the area. I'll focus on two roads, High Pavement and Stoney Street. 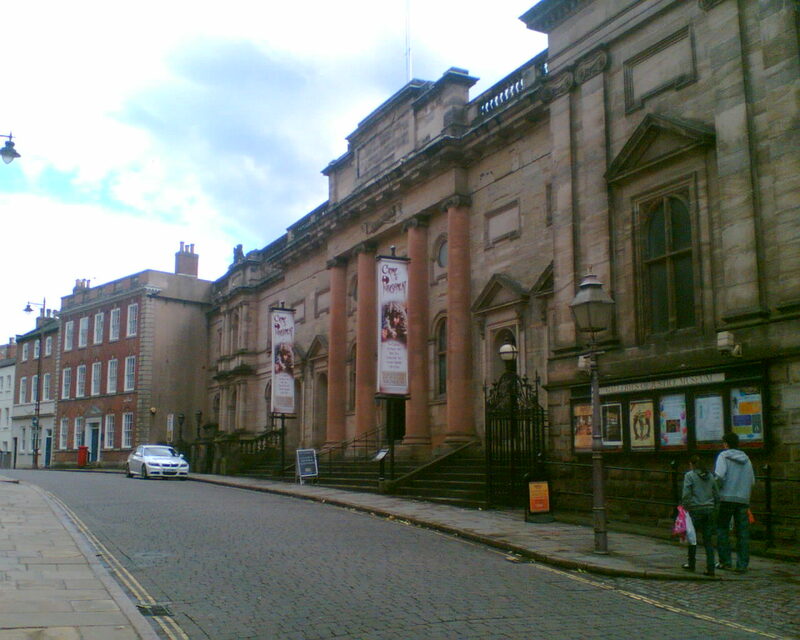 The Galleries of Justice is a museum of Crime and Punishment and tourist attraction on High Pavement. Officially known as Shire Hall, as during the Norman period , Sheriffs were appointed to keep the peace and to collect taxes. The first written record of the site being used as a law court is 1375, and its use as a prison from 1449. The museum is housed in what was once a fully functioning Victorian courtroom, and claims to be, according to the Chief Executive of the Galleries of Justice, "The only site in the country where you could be arrested, sentenced and executed". The hall was re-built about 1770 (so says the inscription above the door), and over the next 100 years, new wings were added and major improvements made. The Victorians closed the jail in 1878, and it lay empty until 1995. A police station was added in 1905, which closed in 1985. 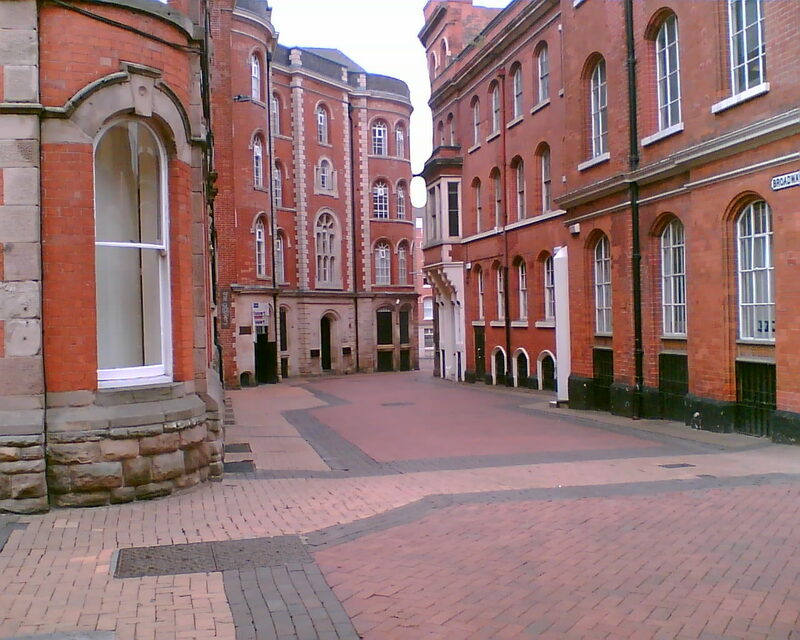 The Hall continued in use as Nottingham's civil and criminal courts until 1991, when the new Crown Court was opened. One of the little things that I love about the building is the work of a stonemason above one of the doors. He had carved "COUNTY GOAL", and it can be clearly seen today the correction to GAOL. I wonder what sort of punishment he received for that mistake? Perhaps it's best not to know. I visited the Galleries of Justice some time ago with my Son, and while I would normally run a mile from any interactive tours, this one was fascinating, as you were given some insight into life in court, and underground in the cells. The building is fantastic, and well worth a visit. The Adams Building is the largest building in the Lace Market, and for some, "It is probably the largest and finest example of a Victorian lace warehouse to survive in the country". It was built in 1854 (opened officially in 1855) and it was added to over the next 20 years. It is without doubt one of my favourite buildings in the Lace Market. The frontage on Stoney Street, which my picture doesn't do justice to, is unbelievably elaborate, sitting behind a railed courtyard. 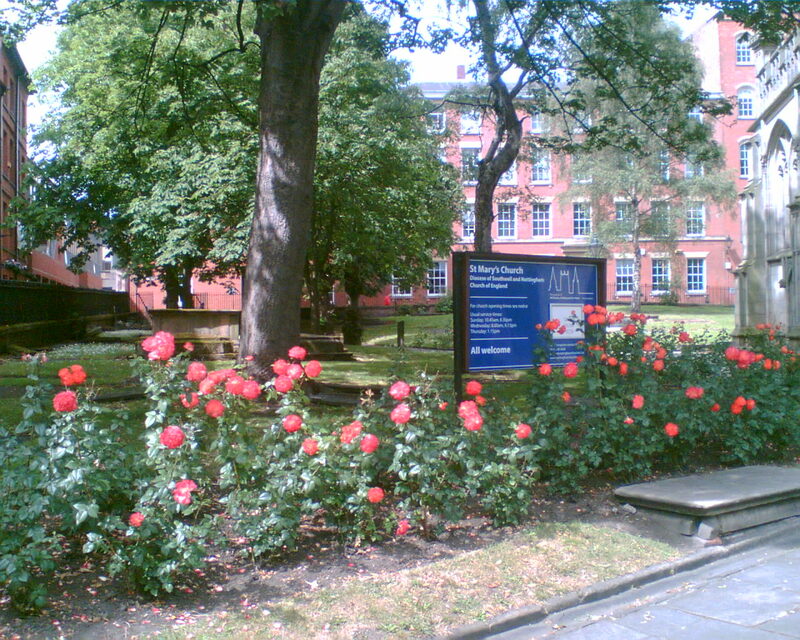 The building is named after its original owner, Thomas Adams, and was designed by another renowned Nottingham architect, Thomas Chambers Hine, who was also responsible for the creation of The Park area. It was designed as a lace showroom and warehouse, in which lace products brought in from other factories were finished off then sold. There was a main display area with apparently a spectacular two-story lightwell in the centre of the building, approached by a grand staircase. Unfortunately, the lightwell has now been closed up. T.C. Hine and Thomas Adams were innovators not just in the physical appearance of the building, but also in the use of light and heat, which became models for other factories to follow. The sheer size and grandeur of the building must have caused astonishment when it opened, not least because of the contrast with the other plainer industrial buildings in the vicinity. A local newspaper described it as the "finest building in the Midlands". 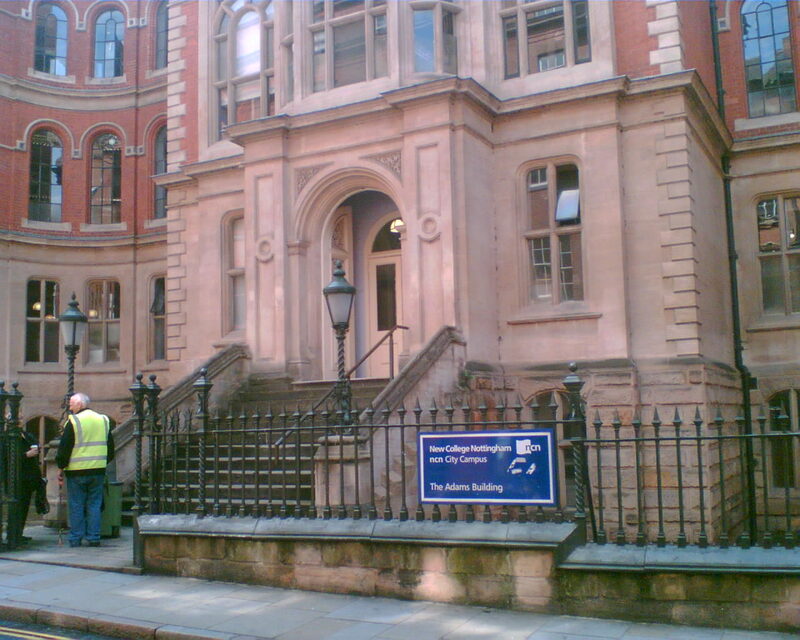 In 1996, the Adams Building was bought by the Lace Market Heritage Trust, and following a £16.5 million restoration, it became the home of New College Nottingham (ncn). 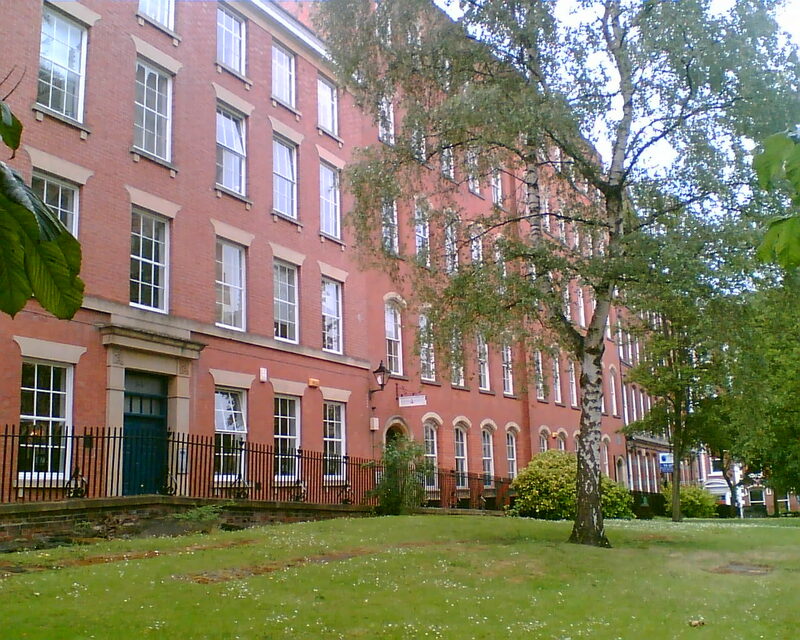 Many of the courses held here (such as fashion and textiles) continue the traditional purpose of the building for the design and manufacture of clothing. In addition to being an innovator with buildings, Thomas Adams was an innovator in his treatment of workers. He may have been a successful industrialist, but he was also a Quaker, with a deep Christan social conscience. Where sometimes religion takes a knocking, let's give praise when someones religious convictions are used for the good of ones fellow man. Thomas Adam was determined to provide humane conditions and good facilities for his workforce. A large area of the basement was designed as a chapel (complete with Chaplain and vestry) where more than 500 workers and managers would take part in a service before starting work. Indoor toilets, washing facilities and tea rooms were provided for staff, and there are records of a sick fund, savings bank and book club. I sincerely hope that the students of New College Nottingham realise what a special place they are studying in. 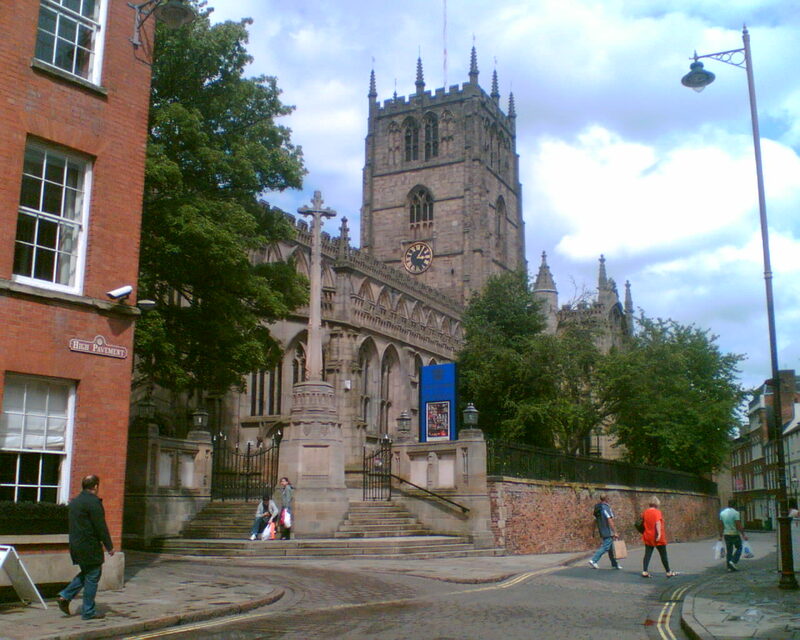 St Mary's Church is on High Pavement, and is the oldest religious foundation in the City; the largest Church after the Roman Catholic Cathedral, and the largest medieval building in Nottingham. Most of the present building is thought to be at least the third building on the site, and the Church is mentioned in the Domesday Book of 1086. The main body of the Church dates from around 1377 (end of the reign of Edward III) to 1509 (Henry VII). The nave and transepts are from the early 15th Century, with the tower being completed during the reign of Henry VIII (1509-1547). It is a most wonderful building both outside and in, and I couldn't begin to do descriptive justice to it in a few words. If you are interested in seeing some outstanding photographs, I suggest that you visit the following website http://www.nottingham21.co.uk/build_stmary_thumbnail.htm . Never let it be said that I don't leave you with useless information. Did you know that from 1716 - 1770, the Church was used to house the town fire engine? And, in 1649, George Fox, the founder of the Religious Society of Friends (Quakers) was imprisoned in Nottingham after interrupting the preacher at St Mary's? What did he say or do to deserve that? 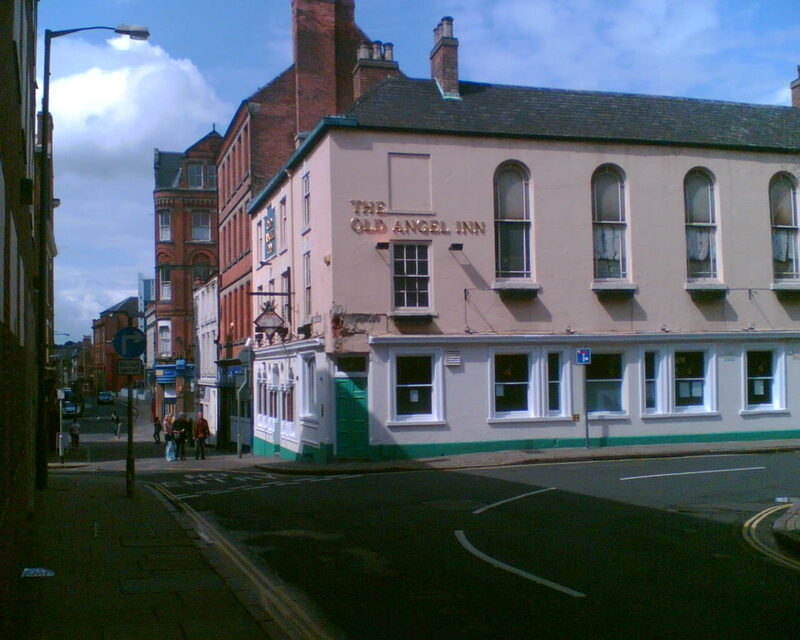 The Old Angel Inn has stood in the Lace Market since at least the 1600's, and has a long and colourful history. It has been the site of two murders in the 1700's (a policeman and a prostitute) and was formerly a brothel and a chapel. The building is still said to be haunted by the ghost of the young prostitute - her soul trapped forever in the ancient walls. Of great interest is the fact that deep underneath the pub, down steep winding stairs below the beer cellar are caves, hollowed out of the sub-soil in the shape of a crucifix. The old chapel, with its double height ceilings is now the music venue. What is it like today? Well, to quote their website, "The Old Angel is a traditional drinkers pub - you won't find posh gasto-grub or 200 expensive wines on offer - but you will get a good pint of well kept beer or cask ale, and the friendliest staff and atmosphere - as well as a great menu of real pub food". It also describes itself as the City's best 'small venue' for live, in-your-face, rock music. So, if "in-your-face" music is not to your taste, but the food and drink is, then get in early - eat, drink and begone. Did you know that the famous groups, Kasabian, Oasis and The Arctic Monkeys have all played at the Old Angel as they kicked off their long road to stardom? The Lace Market is a wonderful, fantastic place steeped in history, but the area is not a museum. People live there, eat there, drink there, play there, work there, shop there and run businesses there. It is alive, and if you haven't already done so, do visit it soon. The following pictures are of random locations throughout the area. If you've any thoughts on the Lace Market, do let me know.